Somehow in the past few years, the term, "cloud" became synonymous with, "it's on the Internet." 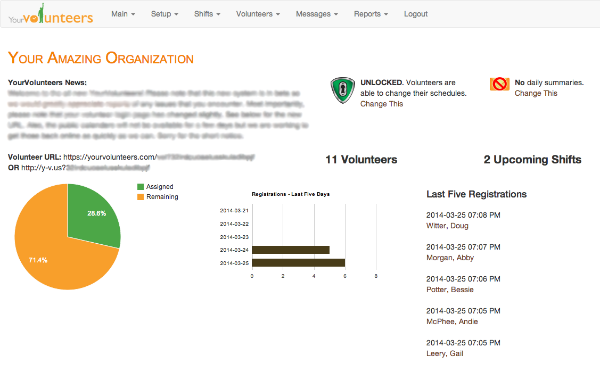 YourVolunteers is truly a cloud-based system meaning that we utilize the incredible power of one of the world's largest cloud services provider. This does not mean that the system may not go down from time to time but if it does, there will be a lot of online systems down at the same time so you might as well go outside and get some fresh air. As many of you who have been with us for many years know, we have gone through a quite a few hardware upgrades over the years as our user base kept growing. The process is not easy and we have to take the site down for a while. Our new cloud-based system will not have that problem as many of the world's top sites use the same system. Isn't this Just a Web-based System? The core of the YourVolunteers system lives in the cloud and you can use a web browser to access it, but it also means that we can create other types of programs on other devices to access it. Yes, that's a hint of things to come. Is this Software as a Service (SaaS)? That would depend on your definition. If you have to make a pitch to your board of directors to be able to purchase the premium version of our system and if you think it would help to include buzzwords, then yes, our system is so totally SaaS.